The film's source material from science-fiction/horror author Stephen King's 1977 best-selling novel (his third novel under his own name) by the same name, bears little resemblance to Kubrick's creation. A four and one-half hour long, made-for-TV mini-series titled Stephen King's The Shining (1997), (with Steven Weber and Rebecca De Mornay), due to King's dissatisfaction, was a more literal rendering of the original source material, and included a famous topiary-animal attack scene. More recently, a documentary titled Room 237 (2012) speculated that Kubrick's film was possibly a veiled and hidden film about the Holocaust, and/or about the genocide of Native Americans. It also made the outlandish claim that Kubrick may have directed the 'fake footage' of the Apollo moon landings (a favorite theory of conspiracy believers). 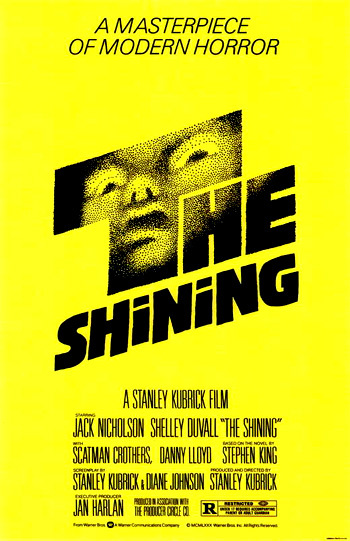 As in many of his films, director Kubrick explores the dimensions of the genre to create the ultimate horror film of a man going mad due to many factors (including alcohol abuse), aspiring writer Jack Torrance (Nicholson), while serving as an off-season caretaker of an isolated, snowbound resort (the Overlook) with his family: wife Wendy (Shelley Duvall) and son Danny (Danny Lloyd). They soon become affected by a "psychic photograph" of a bloody series of historic murders committed there. The film's title refers to the extra-sensory, paranormal psychic abilities possessed by the Overlook Hotel's head cook Hallorann (Scatman Crothers) and the young boy. Kubrick deliberately reduced the pace of the narrative and expanded the rather simple plot of a domestic tragedy to over two hours in length, created lush images within the ornate interior of the main set, added a disturbing synthesized soundtrack (selecting musical works from Bela Bartok, Gyorgy Ligeti, and Polish composer Krzysztof Penderecki), used a Steadicam in groundbreaking fashion, filmed most of the gothic horror in broad daylight or brightly-lit scenes, and built an unforgettable, mounting sensation of terror, ghosts, and the paranormal. The film opens without narration or commentary featuring only Wendy Carlos' funereal-sounding synthesized adaptation of the "Dies Irae" (Day of Wrath) theme from the fifth movement (Dream of a Witches' Sabbath) of Hector Berlioz's Symphonie Fantastique. [Note: The music is similar to Ernest Gold's adaptation of the classic work for the similar B-horror flick The Screaming Skull (1958) - two years later, Gold won the Best Score Academy Award for Exodus (1960).] Stunning scenic views of the Colorado Rockies are presented with magnificent aerial photography - the camera flies in close to the surface of an immense lake in the lap of snow-covered mountains, with beautiful reflective (or mirroring) qualities. [Note: Mirroring and double images are rampant in the film: Danny/Tony, the sane vs. insane Jack, Jack/Grady, the two girls in the corridor, the woman/hag in Room 237, etc.] After flying by a small sliver of an island (with a few trees) in the lake's center, the shot dissolves from the lake to a God's-eye, aerial view of a two-lane mountainous road far below, winding through sun-drenched tall pines in the early morning. The shifting camera views pick up a tiny yellow Volkswagen far below the sole car on the unpopulated strip of road penetrating into the paradisical wilderness in early winter. In more views, it moves across the face of the mountainside from lower right to upper left of the frame as the credits begin to roll, and the camera catches up with the car. [Note: these views are similar to future maze tracking shots, and to the interior of the hotel in the film - a vast series of labyrinthine hallways, doorways and corridors, with a winding red/black/orange carpet design.] As the terrain gets steeper, the valley drops off to the left where the car disappears into a dark tunnel. [On the soundtrack, one can faintly detect the sound of a boy's tricycle going over the rug-covered hardwood floor of a hotel - a foreshadowing of what's to come.] When the vehicle reaches the summit in the magnificent, but isolated mountain region - there is a beautiful, snow-covered crest that dwarfs a vast, sprawling hotel below it. The screen frame goes black. [The Timberline Hotel, a ski resort in Mt. Hood National Forest, Oregon provided the exterior for The Overlook. The interiors of the hotel were all created from scratch inside of Elstree Studios located outside of London - they do not actually exist. The outdoor hedge maze was also constructed there. Stephen King wrote half of his novel in Room 217 - changed to 237 in the film - of The Stanley Hotel in Estes Park, Colorado, a similar-looking hotel]. Jack Torrance (Jack Nicholson in his first major role since One Flew Over the Cuckoo's Nest (1975)) strolls into the palatial lobby of the Overlook, inquiring to see General Manager Mr. Stuart Ullman (Barry Nelson) for his appointment - he has driven three and a half hours distance from his home. In the kitchen/dinette of the Torrances' home in Boulder, Colorado [where they have lived only about three months after relocating from Vermont where Jack was a school teacher], seven year-old son Danny (Danny Lloyd) eats a lunch of white-bread and milk with his passive, skinny, black-haired mother "Wendy" Winifred (Shelley Duvall), who is reading The Catcher in the Rye. Danny: (He uses his index finger as a bobbing, wiggling puppet-figure to act and speak in a roughened, croaking voice like Tony - a fantasy character of his imagination.) No he isn't, Mrs. Torrance. Danny (as Tony): I don't want to go there, Mrs. Torrance. Danny (as Tony): I just don't. Jack: Uh, formerly a school-teacher...I'm a writer. Umm, teaching's been more or less a way of making ends meet...I'm lookin' for a change. General Manager Ullman explains that the regular season runs from "May 15 to October 30th and then we close down completely until the following May" - a period of six months when the deserted, off-season, snow-bound hotel is closed and inaccessible during the brutal, terrifying winter weather. Mild-mannered, congenial Jack has already been recommended and hired through the Denver office, so Ullman dispenses with typical interview questions and describes the job's essential requirement - to keep the cruel, winter "elements" (both physical and psychological) at bay with maintenance and repair of the building. Jack: Well, it's certainly got plenty of that, ha, ha. Ullman: ...The winters can be fantastically cruel. And the basic idea is to cope with the very costly damage and depreciation which can occur. And this consists mainly of running the boiler, heating different parts of the hotel on a daily, rotating basis, repair damage as it occurs, and doing repairs so that the elements can't get a foothold. Ullman: That's very good Jack, because, uh, for some people, solitude and isolation can, of itself become a problem. Ullman: I don't suppose they, uh, told you anything in Denver about the tragedy we had up here during the winter of 1970. Ullman: Well, uh, my predecessor in this job, hired a man named Charles Grady as the winter caretaker. And he came up here with his wife and two little girls, I think about eight and ten. And he had a good employment record, good references, and from what I've been told, I mean he seemed like a completely normal individual. But at some point during the winter, he must have suffered some kind of a complete mental breakdown. He ran amuck, and uh, killed his family with an axe. Stacked 'em neatly in one of the rooms of the West Wing, and uh, then he, uh, he put, uh, both barrels of a shotgun in his mouth. Police, uh, they thought that was what the old-timers used to call cabin-fever. Kind of claustrophobic reaction which can occur when people are shut in together over long periods of time. Jack: Well, that is, uh, quite a story. Jack: I certainly can, and uh, I also understand why your people in Denver left it for you to tell me. Ullman: Well, obviously, some people can be put off by the idea of staying alone in a place where something like that actually happened. The next scene is in the Torrance home's bathroom [strikingly similar in composition and appearance to the hotel's Room 237 bathroom where Jack has a traumatic vision later in the film]. In front of the bathroom mirror as he brushes his teeth, hyper-intuitive Danny is already receiving clairvoyant, visionary messages (his gift of "shining") from his make-believe playmate "Tony." He is told that his father has been offered the hotel job. Danny foresees the future with his psychic, paranormal powers, accurately predicting that Wendy will receive a phone call from Jack about the job. At first, Tony resists but then delivers a terrifying, bloody, psychic vision of the past [is the vision real or only illusion?] - a warning about the hotel. Danny is connected to a view of the hotel's murderous forces and senses something evil about their family's future home even before they arrive. Torrential waves of deep-red blood silently splash from the double-doors of an elevator in the hotel lobby, decorated art-deco style. Blood squeezes out of the firmly-shut red elevator doors and fills the lobby. Two of the Overlook's time-warped occupants - a pair of young, mannequin-like twin girls (Lisa and Louise Burns), each wearing a blue party dress [are they the previous caretaker Grady's two murdered daughters? ], holding hands in a flower-wallpapered hallway, and staring grimly at the camera, appear in a cut-in for an instant between the engulfing waves of spilling blood. [It is later learned that the hotel was built upon American Indian burial grounds - does the blood also symbolize the spilling of native-American blood?] Danny's horrified face reacts with mouth gaping open. It was just one of those things, you know. Purely an accident. My husband had, uh, been drinking, and he came home about three hours late. So he wasn't exactly in the greatest mood that night. And, well, Danny had scattered some of his school papers all over the room, and my husband grabbed his arm and pulled him away from them. It's-it's just the sort of thing you do a hundred times with a child, you know, in the park or in the streets. But on this particular occasion, my husband just used too much strength and he injured Danny's arm. (she gives a nervous laugh) Anyway, something good did come out of it all, because he said: 'Wendy, I'm never gonna touch another drop. And if I do, you can leave me.' And he didn't, and he hasn't had any alcohol in, uh, five months. In the game room where Danny amuses himself by throwing darts, he has another flash of a premonition - the two, blue party-dressed young girls make another visitation. They stand and watch him, and then turn away. Ullman shows the Torrances the staff quarters: "The place is very nicely self-contained, easy to keep...Yes, very cozy for a family." Jack comments: "Well, it's very, uh, homey." Construction started in 1907. It was finished in 1909. The site is supposed to be located on an Indian burial ground and I believe they actually had to repel a few Indian attacks as they were building it.